One of the best things about cruises is their variety; modern cruise ships from leading cruise lines like Royal Caribbean and Carnival are fitted out with an astonishing array of features and facilities, from standard amenities like swimming pools and restaurants to more unique options like laser tag arenas, enormous water slides, floating viewing platforms, and Broadway-style shows. Not only that, but cruises also offer a huge amount of variety in terms of their destinations, with lots of different routes available from one month to the next. September tends to be a good month for people wishing to take cruises without paying over the odds. The summer season has just ended, and a lot of families will be heading back to work and school, so the cruise prices in September tend to be a little lower than they would have been in June, July, and August. This means that budget cruises are popular in September and you can get some really good deals if you shop around, make use of price comparison sites, and do your research to find the best deals. With that in mind, let’s take a look at some of the best cruises you can take in September. For something a little different this September, why not try a trip to Alaska? 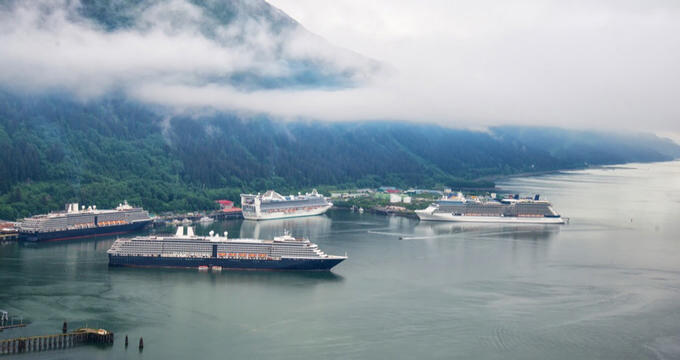 The Last Frontier is home to some outstanding natural landscapes and an amazing array of wildlife, making it a prime spot for a sightseeing cruise, and you can enjoy it all on board the Oosterdam with Holland America Line for the '7 Night Alaskan Explorer' cruise. This September cruise lets you travel on one of Holland America Line's best ships. The Oosterdam is exceptionally elegant, having been furnished and decorated to the highest standards, blending classic nautical tones and imagery with a European sense of class and style to create a ship that is simply a joy to behold. Having recently been renovated to become better than ever, the Oosterdam comes complete with unique features like the B.B. King Bluges Club, Billboard On-Board shows, BBC Earth Experiences, the Lincoln Center Stage, the Music Walk, and more. In short, there are a lot of fun ways to pass the time on this ship. The '7 Night Alaskan Explorer' cruise sets off from Seattle in Washington State and makes a total of four stops around Alaska and Canada before heading home. The first stop is at Juneau, the state capital of Alaska and one of the most unique state capitals of all due to its relatively small population and amazing local scenery. Next, you'll cruise past the Hubbard Glacier, so will need to have your camera ready to take some photos before stops at Sitka and Ketchikan complete the Alaskan leg of your expedition. Your final stop will be in the pretty coastal city of Victoria, British Columbia, Canada. September is a great month to cruise as there are several great repositionining cruises to choose from at this time of year, with the '14 Night Transatlantic Westbound' cruise from Carnival being a fine example. Repositioning cruises are when cruise ships travel long distances, typically across the Atlantic Ocean, to prepare themselves for the coming months. These cruises are often available at extra low prices due to their one-way, long-distance nature, and the '14 Night Transatlantic Westbound' is no exception. Taking place on board the Carnival Marid Gras, which is one of the newest ships in the Carnival fleet, this September cruise can leave you with many happy memories. You'll find a wealth of options in terms of things to do on board this ship, and you definitely won't ever run the risk of being bored with so many different restaurants, bars, lounges, decks, games, activities, shows, and more. There's always something exciting waiting on the next deck of this ship, so you'll have plenty of ways to pass the time during the two weeks of your voyage. This amazing transatlantic September cruise sets off from Southampton in England, with its final destination being New York City. The Southampton-New York trip is an iconic voyage and a great cruise to take, stopping off at several locations like Las Palmas and Santa Cruz de Tenerife in the Canary Islands and Funchal in Madeira. Your fourth stop will be Ponta Delgada in the Azores Islands of Portugal, so you'll have lots of different opportunities for sunbathing, snorkeling, water sports, and much more before arriving in NYC. A classic September cruise that runs every year on multiple dates, the '5 Night Western Caribbean' from Royal Caribbean is always a popular choice at this time of year. The summer might be over and the colder weather might be creeping in for many locations, but if you choose to travel on this cruise, you'll be able to enjoy some wonderful fun in the sun for a few days before heading back home. The '5 Night Western Caribbean' departs from the port of Galveston in Texas and makes two stops around the western side of the Caribbean Sea. For this Royal Caribbean September cruise, you'll be able to enjoy a journey on board the incredible Enchantment of the Seas. A beautiful, breathtaking ship with an enormous range of facilities and features, the Enchantment of the Seas offers much more than standard cruise ships. It's fitted out with a lot of world class dining options, some amazing bars, Broadway-tier live shows, fun games and activities for children, and a lot more. The first stop on this September cruise is at Costa Maya. Situated out on the Yucatan Peninsula of Mexico, Costa Maya is a popular resort location. You can spot dolphins, sea turtles, tropical fish, and more in the waters just off shore, with the nearby Sian Ka'an Biosphere Reserve also being a great spot for wildlife and nature enthusiasts. Next, your journey will take you over to the island of Cozumel, famous all over the world for its top class scuba diving spots. Cozumel is also home to some tall palm trees and silky soft sands, so it's a great place for people to just lie back on the beach, relax, and feel like they're living on their own private island.